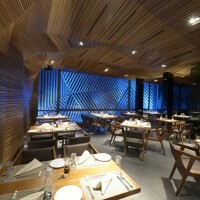 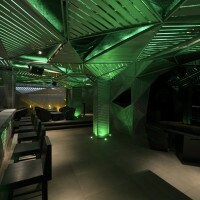 Sanjay Puri Architects have designed Auriga, a restaurant and nightclub located in Mumbai, India. 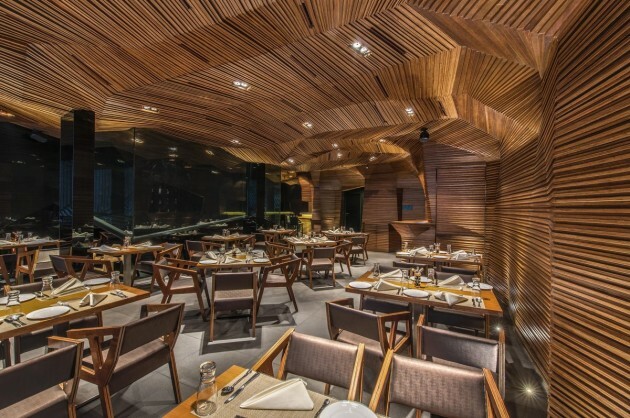 An old factory warehouse was stripped off its external walls to allow the insides to be infused with natural light and create a view of the large trees along the road from its internal spaces that were transformed to a restaurant and a nightclub. 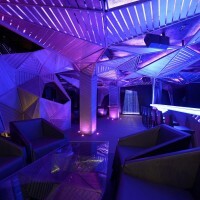 The upper level with a better view, houses a restaurant space and the lower level opening into an outdoor patio is a nightclub. 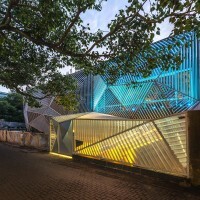 The entire building exterior is created in a web of aluminum fins that are folded in angular planes. 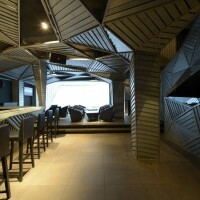 This geometry is carried through into the interior of the ground level where the web is more abstracted and sheaths the walls, ceiling, staircase, bar and columns. 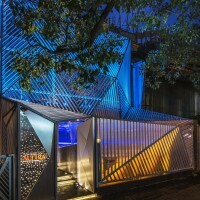 Partially open and partially enclosed in strips of galvanized metal sheets that are backlit, the entire space is rendered sculptural with the integration of all design elements within the abstractly woven web. 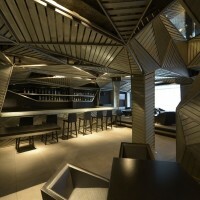 A black palette forms the backdrop for this metal web with a flamed dark grey granite floor, black walls and black sound insulation fiber boards constituting the ceiling. 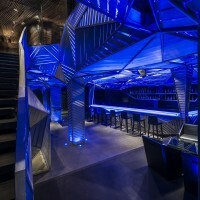 A single flight stairway traverses through a 24’0” high volume from the metal dominated nightclub at the lower level to a wood enclosed restaurant above. 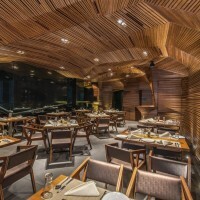 The walls, ceiling and live kitchen counter and serving bar counter are sheathed in undulating angular planes of thin wood strips creating a fluid volume for the restaurant. 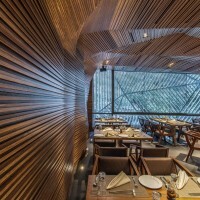 The two levels are in complete contrast, with one dominated by steel and the other by wood to create different experiences within the same space. 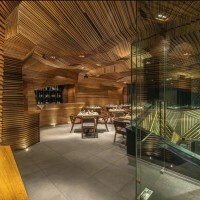 The abstraction of each space with one merging into the other through the double height volume located centrally integrates them simultaneously. 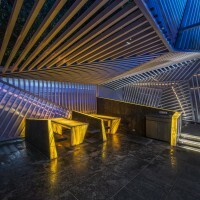 Both spaces create the feeling of being within a sculpture redefining the way internal spaces can be perceived.